The grey wolf subspecies Canis lupus signatus was idenified by Spanish zoologizt Angelus Cabrera in 1907. Though many taxonomists do not recognize it, genetic work by biologist Robert Wayne of UCLA suggests that it is a true subspecies. The Iberian wolf inhabits the forests and plains of the northwestern part of Spain, the northeastern top of Portugal, and a few isolated areas in the Sierra Morena, Spain. 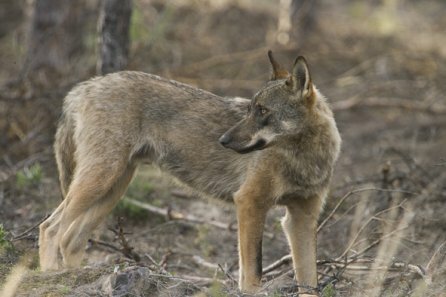 Over 50 percent of the Iberian wolves reside in Northern Castilla y Len. Iberian wolves are of medium size with a thinner build than the average Eurasian wolf. Males can weigh as much as 90 pounds and females are usually 75 to 80 percent the size of males. Their coat will vary in color from a lighter grey or ochre in the warmer months to a darker reddish brown during the winter. The name signatus (meaning marked) was derived from white marks on the wolf's upper lips, and dark marks on the tail and front legs. 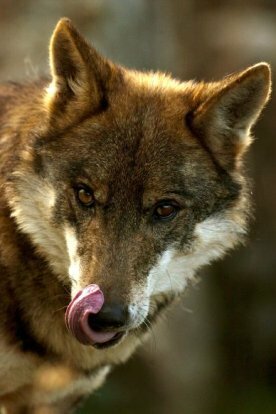 The Iberian wolf's diet will greatly vary depending on exactly where they are. Wolves of Cantabria may feed on red deer, roe deer, and wild boar while the wolves of Galicia will feed partially on remains from chicken and pig farms. The wolves of Castilla y Len are believed to feed largely on rabbits. Overall, their main source of nuitrition comes from livestock. Much of this livestock used to be carrion. However, since the banning of leaving dead animals in the field because of the fear of mad cow's disease, the wolves have turned to killing more sheep and cows. Like most other gray wolves, Iberian wolves breed only the alpha male and female in order to maintain the strength of the pack. Female wolves can usually begin breeding at one year, but don't fully mature until they reach 5 years. Breeding season is at the end of winter. The liter is usually 5 or 6 pups that are looked after by the entire pack until autumn when they join in with the others. They must be protected from eagle owls and golden eagles for the first few weeks. The Iberian wolf once inhabited the vast majority of the Iberian Peninsula. However throughout the 1950s and 1960s, the wolves of Spain became officially recognized as pests by the Spanish government who offered a bounty for dead wolves. The wolves' number decreased to as few as 400 to 500 and they were classified as endangered. Hunting of wolves has since been banned in Portugal and many parts of Spain. Their number has been estimated at about 2,000 in Spain and another 400 in Portugal. Their	overall state has upgraded from endangered to vulnerable. 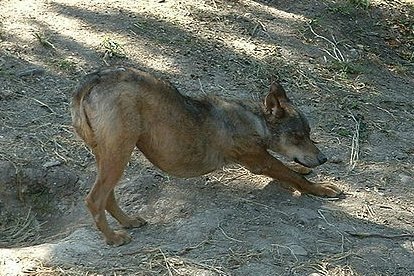 However, the wolves of Sierra Morena are classified as critically endangered, and the Extremaduran populations are believed to be extinct. Wolves have over the years become very wary of people, and actual sightings of wolves in the wild are, therefore, rare.